This week I am in Sussex running some stone carving workshops in relation to the Heathlands Reunited that project that I have been involved with for some time. The heathlands reunited project seeks to maintain and expand these important ecological areas in the South Downs National Park. As part of this, I have been asked to create 7 sculptures that will be located in 7 of the heathlands. The artworks will take inspiration from the unique animal and plant life found on the sites but also from the history of each site. Further inspiration is available from a vast collection of oral histories that have been collected by volunteers over recent months, retelling personal stories and memories of the heathlands. Over the next 2 weeks, I will be working with a number of schools to relay the message about the importance of the heathlands and to intruduce the sculpture project. Yesterday I ran a very successful stone carving workshop in Bury School and earlier today was in Steadham Primary School. The children were given the opportunity to design and create their own stone sculptures inspired by the heathlands. The quality of their designs and subsequent enthusiasm to create the work has resulted in some wonderful carved artworks that the schools are able to keep. Designs included lizards, heather, snakes, insects, night jars as well as bronze age tools. 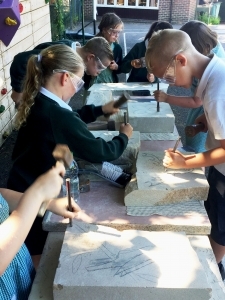 The children were given stone carving tools and some guidance and set about carving their mini masterpieces. 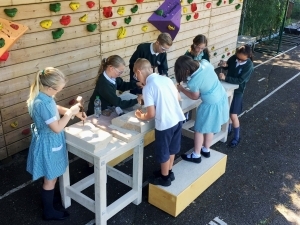 So far the workshops have been very successful, productive and enjoyable and the children have has a unique opportunity to create an artwork that the school can be proud of for decades to come. The aim is commence carving work on the 7 sculptures for the heathlands around November time with installation taking place early next year.